Learn more about the psychology degree program at Rollins College. 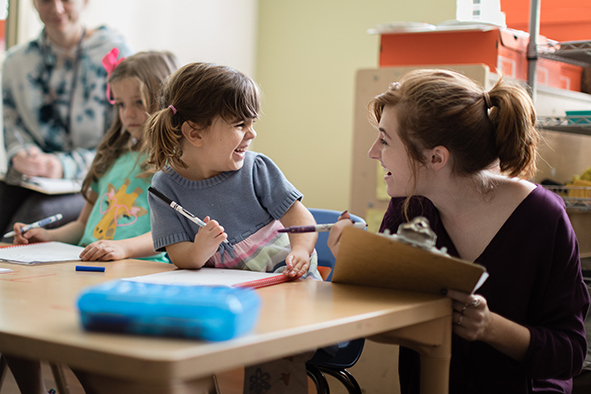 From experimental labs and practice in clinical therapy to our on-campus laboratory preschool, the psychology program at Rollins emphasizes experiential learning, allowing majors to hone their knowledge through real-world applications. You would be hard pressed to find a major at Rollins with more breadth of applications than psychology. It has relevance in every personal relationship and every career. That’s why students with degrees in the major understand the world in a whole new light—the “world” being people in the same room or across the globe. The emphasis is on experiential learning, which includes work with preschool children, practice in clinical therapy, and performing experimental labs. These hands-on experiences are rare for undergraduates, let alone first- and second-year students. With them, they can determine which specific application of psychology they want to further explore, be it education, business, or as a practicing psychologist. Invaluable Life Skills Clinical and behavioral psychology are just two career paths for which a Rollins student is prepared. Graduates in this field excel in health care, hospitality, marketing, real estate … but also as spouses, parents, and friends. Individual Mentoring Rollins’ small class sizes allow the professors to be your mentors. They know you as a person with unique skill sets and goals. With this kind of personalized mentoring in college, the future is less daunting. Tailoring Your Degree Even students who think they know what they want to do beyond college should put their vision into practice, long before graduation. That’s the reason for so much firsthand experience at Rollins. Try it all first. Then determine what excites you. PSY 319 The Psychology of Work By examining group dynamics in organizations (including dysfunction), students are prepared to be better leaders. This type of relational thinking has become a valuable skill for the most forward-thinking businesses of the day. PSY 320 Psychotherapy with Lab In this creatively collaborative class, theater students improvise as clients for students working as the psychologists. It’s as close to real clinical situations as possible without compromising the privacy of patients. PSY 328 Developmental Psychology with Lab Students observe young children and personally work with them and their families at the Hume House, an actual preschool built on the Rollins campus. It is the most authentic developmental lab you could possibly imagine. PSY 341 Learning with Lab There are few colleges in the country where undergraduates carry out their own labs using live rats in operant chambers. Students analyze behavioral patterns and witness the phenomena of learning. PSY 324 Neuropsychology When we understand the ways our brains are wired differently (and similarly), we can understand the world better. The brain is the root of why people have different outlooks on life and why we interact with the world the way we do. PSY 329 Environmental Psychology Why do you feel a certain way on a sunny day? What about in the confines of a dark, cluttered room? This class explores how natural and built environments affect thoughts, feelings, and behavior. Internship Opportunities Rollins partners with prominent health-care organizations to show our students how real-life solutions arise from collaboration among leaders in business, health, and education. Alexis Satterwhite ’16 turned her internship at the Florida Hospital Innovation Lab into a full-time job as a project liaison. Research for Publication Students can work alongside instructors through the Student-Faculty Collaborative Research Program and conduct independent studies. As a result, Rollins undergraduates are often published in scholarly journals as you would only expect from graduate students at other universities. International Studies The world itself is the ultimate psychology lab. So there’s no better way to examine how cultures influence behaviors than to study in countries like Spain, Australia, and England. Your psychology advisor will help you create a plan tailored to your personal interest.